Often enough, modality has also been confusing. 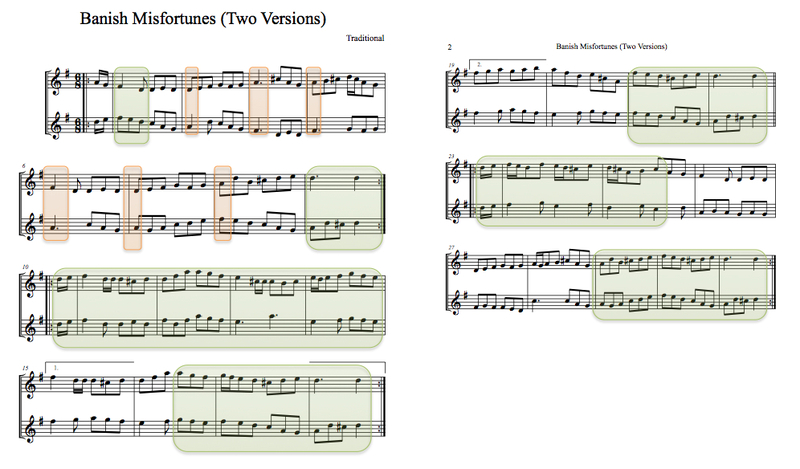 In this post, I’ll illustrate some basic points about the musical modes, focusing on a well-known Irish fiddle tune, Banish Misfortune, which exists in a couple of different modal variants. 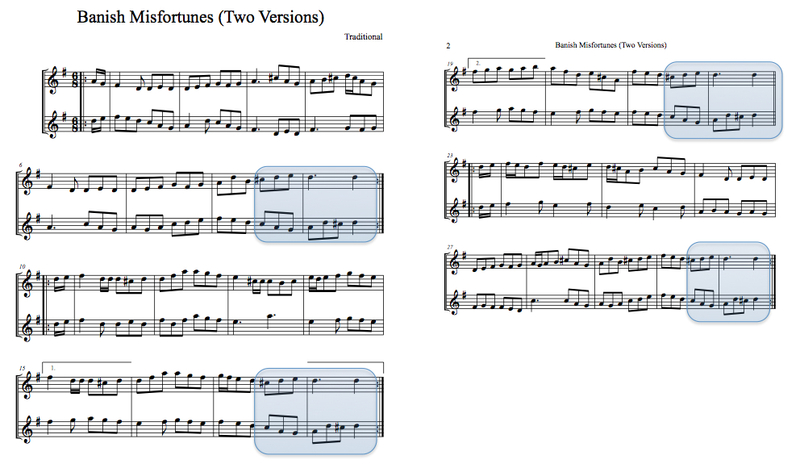 Somewhat unusually, Banish Misfortune is a three-part tune (most traditional dance tunes have two parts.) 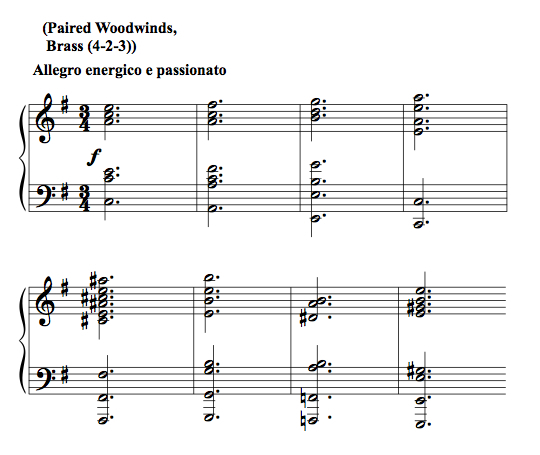 Each part concludes with the same cadence figure—a melodic pattern that ends the phrase. (This is sometimes called “cadence rhyme.”) Here, it helps make very clear the three-part structure of the tune. But as mentioned above, there is more than one version of this tune. That is not unusual in folk music; tunes are transmitted aurally, not primarily ‘fixed’ in written versions. Each player is free to add, simplify or vary the melody, and the result is that popular tunes can exist in numerous different versions. Banish Misfortune certainly fits that description. If you look carefully at the second version–yes, I know it’s awfully small!–you might notice something: the C-sharps are found only at the cadences—outside the blue boxes, only C–naturals are to be seen. 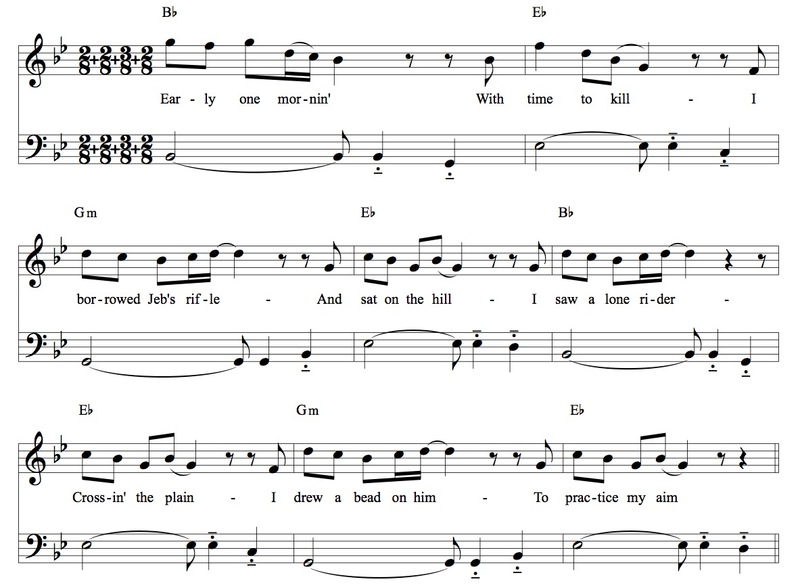 Not in the 1850 version, though: in it, one finds C-sharps consistently. 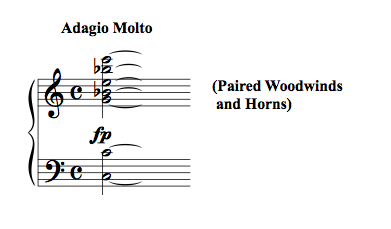 That note—C-sharp versus C-natural—is the difference defining the different modes of these variants of the tune. The 1850 version is in D major, whereas the later version is in the modal scale we would call D Mixolydian. From a scalar perspective, one note is all it takes! 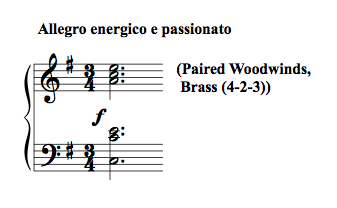 The “Ionian” mode’s scale does not differ from that of major keys—though theorists might differentiate between Ionian and major on other, more subtle, grounds. Mixolydian features a lowered 7th scale degree, as just illustrated by the C-naturals of the second version of Banish Misfortune. 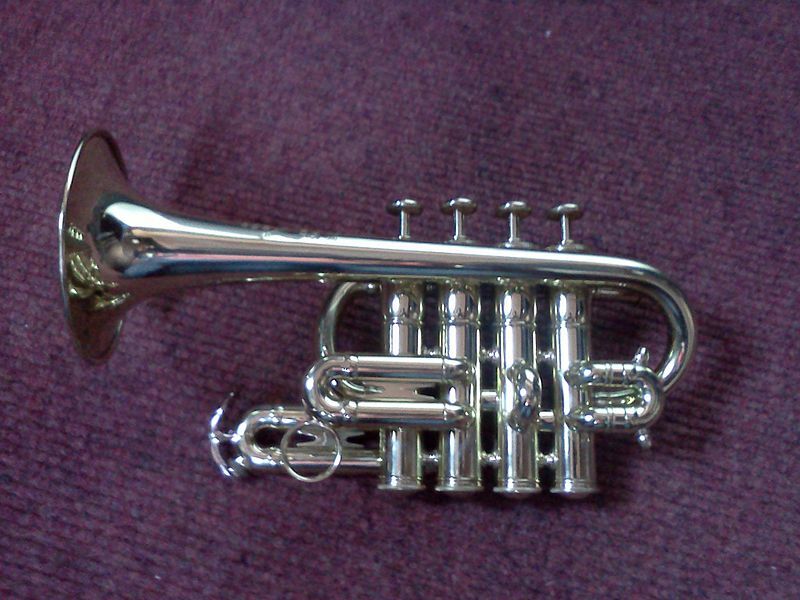 Lydian is defined by a raised 4th scale degree—the Cronin version could be converted to Lydian, for instance, by raising all the G-naturals to G-sharp. It’s a bit strange, isn’t it? (And I don’t mean the cut-off last line–sorry about that.) The characteristically Irish melodic turns and rhythms assort oddly with a mode that is not at all typical of the genre. Aeolian corresponds to the so-called ‘natural minor scale.’ Dorian—like Mixolydian, a fairly common mode in Western European folk music—differs by a raised sixth scale degree (relative to the Aeolian.) (Readers familiar with the well-known tune “Greensleeves” may possess an example of this: that tune is heard in both Dorian and Aeolian incarnations.) 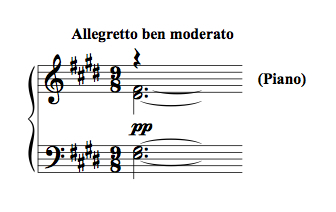 Phrygian—more ‘exotic’ to many listeners—features a lowered second scale degree. Click here to read more about him. 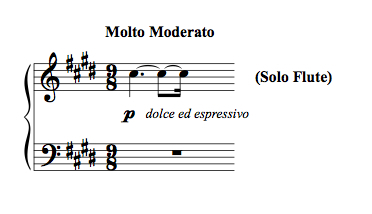 Name of Mode Final (“Starting tone”) and scale degree, relative to the major (Ionian) mode. In a way, that approach is illustrated by the notation chosen above for the dual versions of Banish Misfortune. 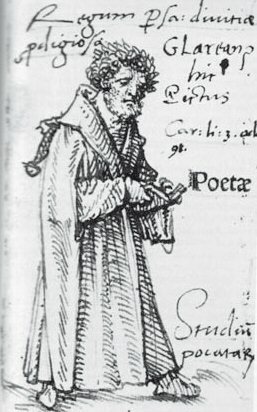 Some astute (and detail-oriented!) readers may have noticed that although the tune is in D, I used the key signature appropriate to G major. That is quite normal for the Mixolydian version of the tune (lower staff.) Consider it from the perspective of G major. If G is ‘scale degree 1,’ then ‘scale degree 5’ would be D. And, according to the table above, it is ‘scale degree 5’ which forms the final of the Mixolydian scale. Thus, D Mixolydian would usually be written with a key signature of one sharp. Let’s turn back to the tunes themselves for a bit. A quick overview can be had by listening to the two played simultaneously. It’s not a particularly pleasant musical experience, it must be admitted—the modal clash between C and C# does sound quite sour —but the simultaneous presentation does rapidly highlight where and how the tunes diverge or coincide. 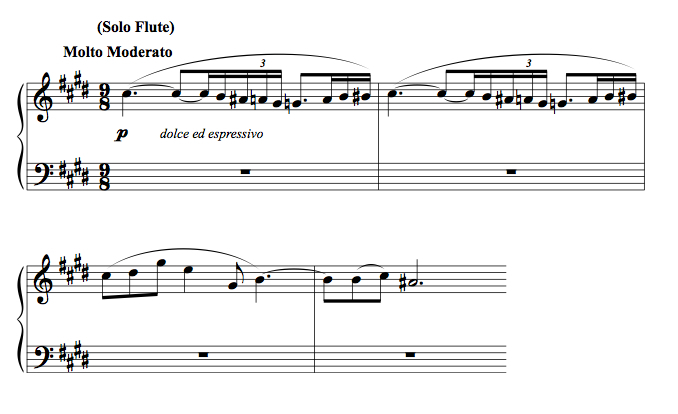 You can tell that the first section differs the most, while the second section is most similar—in fact, for much of the second section it sounds as if just one tune is playing. The third section occupies an intermediate place in this scheme. I’ve illustrated that visually below. The green boxes highlight specific similarities of pitch or contour; the yellow-orange boxes identify a more subtle correspondence found between the ‘A’ sections of the tunes: for six successive downbeats, the two melodies form a dyad—a pair of pitches—from the tonic triad. 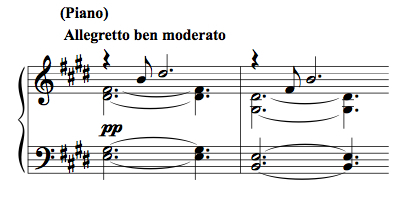 There’s an irony here: a modern listener might tend to perceive the modal version of the tune as more ‘primal,’ older, while the 1850 version seems somewhat conventional. The reality is different: though I don’t know when the earliest Mixolydian version of Banish Misfortune dates from, it is said that the popularity of versions such as the one I used (and present above) dates only from the 1960s, when the renowned Irish band The Chieftains recorded it! It’s not hard to see that the first two measures are repeated, transposed up a whole step, in measures three and four, nor that the harmonic rhythm—the rate at which chords change—speeds up in the second line. 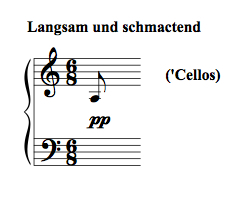 In bars 5 and 6, there is twice as much harmonic information, since the repetition of the first two chords is eliminated and two new chords substituted. The upward transposition in mm. 3-4—we noted that above—then suggests a secondary key area of D. (Tonicization of “ii” (or “II”) is a strategy that Franz Schubert was rather fond of, by the way; it can be observed in the ‘Unfinished’ Symphony, among other works.) Again, there is no tonic function actually heard. The “minor seven flat five” chord at the beginning of measure 5—also known as a half-diminished seventh—suggests a minor, not major key, since it fits naturally into the minor mode, unlike the minor seventh chords which heard in previous versions of the “ii-V.” I suspect, though, that the chord quality has more to do with preparing what we hear next than with the niceties of chordal implication. It’s easy to understand why this is a musical ‘plot twist’—suddenly we find ourselves in a distant tonal area. It’s perhaps a bit less obvious why it still makes sense. 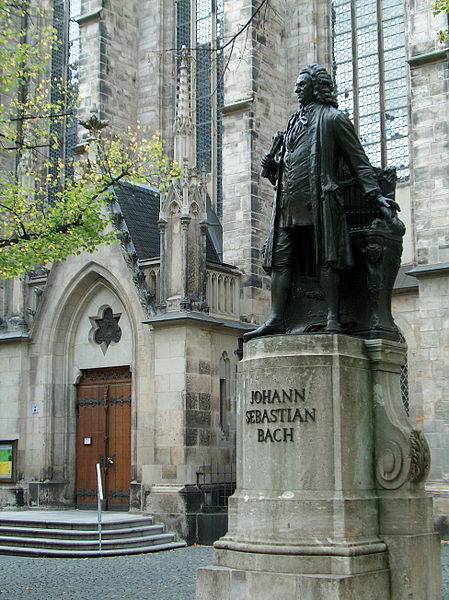 Jazz, as an art for which improvisation is highly important, and in which individual expression is prized, has developed many techniques by which common (as in ‘shared’) melodies and lines can be expressively inflected by improvisors and arrangers. One is the concept of chord “substitution.” As I’ve explained elsewhere, a common form of substitution involves using third-related chords—for example, an A minor triad might be used in place of a C major triad. This has a certain logic in that two of three tones are common to both chords, yet the effect can be surprisingly fresh. A bit more exotic is the “tritone substitution.” It, too, goes back to earlier antecedents—it can be found, for example, in Chopin. It consists of substituting for a dominant seventh chord—say, G7—the dominant seventh a tritone away—say, Db7. This may seem arbitrary at first blush, but makes sense upon reflection: the two most active tones in the chord, the third and seventh, are actually common to both chords (if we neglect a little enharmonic respelling.) For example, G7 has for a third “B” and for seventh, “F.” For Db7, the tones switch: “F” is now the third, while “B”—respelled as Cb—becomes the seventh. In Satin Doll, then, Ellington has applied the tritone substitution to the entire “ii-V” progression, not just the dominant seventh itself. It’s the perfect musical plot twist, as logical as it is unexpected. The ‘modular construction’ we’ve been looking at also reminds me in a way of Andy Warhol’s pop-art work: everyday objects—for the “ii-V” is as everyday as a soup can—arranged artfully enough become art themselves once again, momentarily liberated from the banal patina of overexposure. But Ellington did it first, did it less obviously, and for my money had more fun with it—with Ellington, it’s ingenuity, not irony.